This past Sunday I tagged along with my parents and some of their friends to a dinner at Al Dente, Roberto Donna’s latest restaurant. I was surprised to discover that the meal that night was a fixed wine dinner, in which each course is presented with a special wine. Now, despite my Italian relatives pushing glasses of wine under my nose and insisting I take a sip for most of my childhood (to which I always responded with a wrinkled-nose expression of horror), I don’t have much experience with wine and I have always felt kind of “meh” towards it. This was my chance to taste the differences between wine types and maybe to a acquire a more educated taste for them, so I can finally have a good reason to hate the boxed wine that is a staple of college BYOB’s. We were served a fixed 5-course meal, which I had to modify because I don’t eat red meat, so some of my courses were different from what others got. I apologize for the atrocious photos, I did not bring my camera and had to resort to my phone camera. 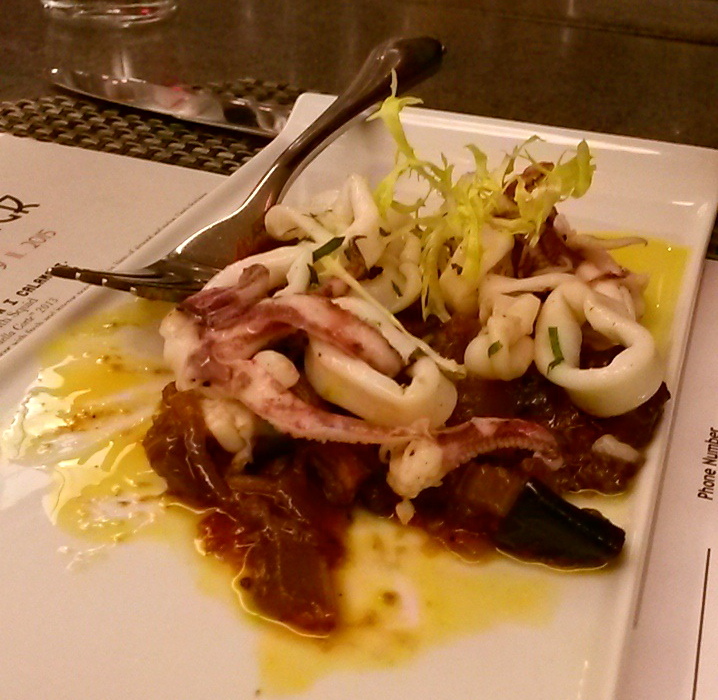 We started with a caponata with calamari. Caponata is a sweet and sour eggplant dish that is common in Sicily, made with cubes of fried eggplant, celery, onion, capers, olives, vinegar, and sugar. I had steeled myself for a jammy caponata experience, but this iteration was balanced, not too sweet at all. Though I could have done without the calamari on top, which were lacking in the flavor department, the caponata itself was quite good. But I can’t say it beat my nonna’s caponata. This was paired with a Grillo white wine, which according to the description has “intense notes of citrus” and “hints of almond and melon”. To my uneducated palate, it tasted like… white wine. 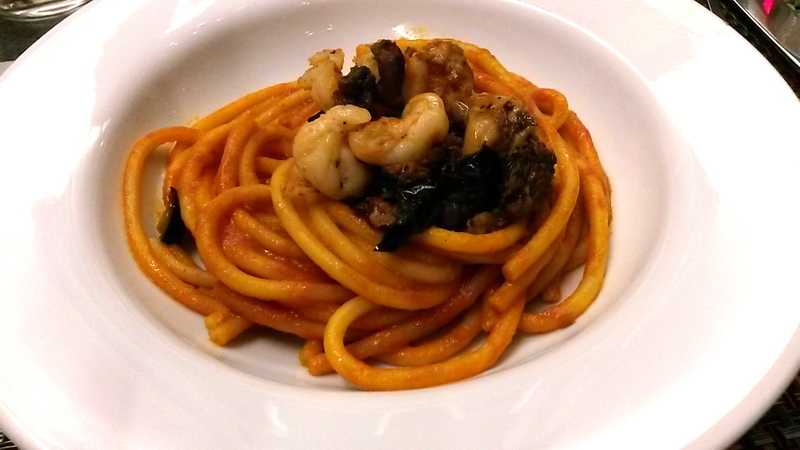 Next, we had bucatini with eggplant and shrimp. Bucatini is a type of pasta that is like a spaghetti but thicker and with a hole running through the strand, like a straw. When you eat it, you can kind of inhale through the straw (but try not to inhale the sauce that may be lodged inside). The pasta had a nice tomato sauce and was topped with some really delicious cubes of eggplant. The shrimp was a nice touch, giving a burst of marine sweetness when bitten into. 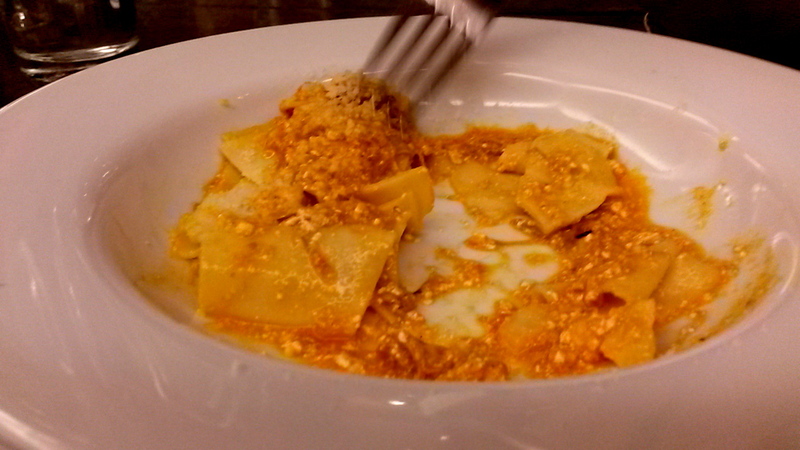 This dish was paired with a Nero d’Avola red wine called “Chiaramonte”. This one supposedly had “aromas of plums, blackberries, black cherries, clove, black pepper, liqouroice, [and] dark chocolate”. 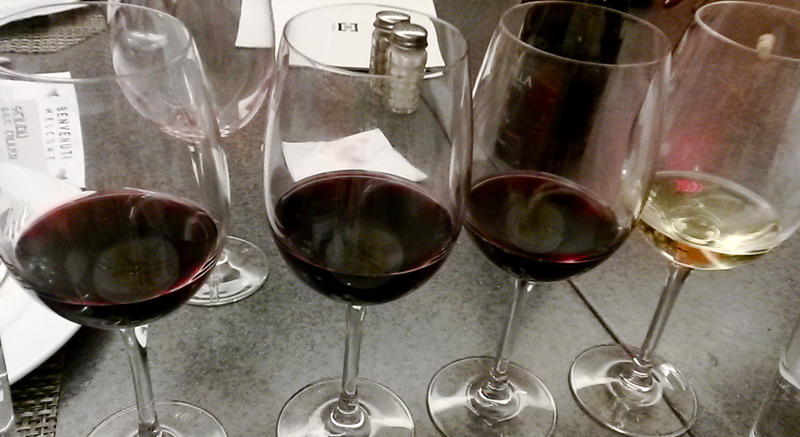 After comparing it to later courses’ red wines, I think I began to taste a hint of the dark chocolate. 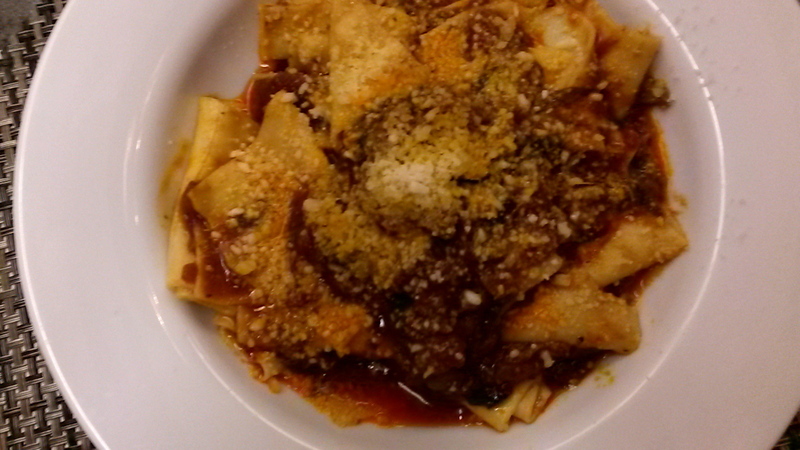 The third course was lasagna pasta with ricotta and pork ragu, but I got a variation with mushrooms and tomato sauce. The sauce on my dish was a lot stronger in flavor than that of the meat version, whose sauce was more delicate. This course was many people’s favorite of the night because the pasta was freshly made and tender and the ricotta and pork sauce was apparently excellent. I enjoyed my version because the house-made pasta had a great texture and the sauce had a deep umami flavor from dried mushrooms. The one problem my mom had with this dish was that it, in her opinion, is not Sicilian. However,”lasagne cacate”, which the dish we were served was based on, is a traditional Christmas dish in the Sicilian province of Ragusa and is also eaten throughout the western side of Sicily. My mother, being from the eastern side of the island, had never heard of such a thing. This course was paired with a Syrah with “light nuances of vanilla and spice”. While I could taste the difference between it and the previous red wine, those “light nuances” were too light for my inexperienced mouth to grasp. We were approaching full stomach capacity when the fourth course was placed in front of us. For everyone except me this was a grilled flank steak with a Sicilian olive and caper salsa and a little potato souffle on the side. For me it was a piece of fish (bass?) 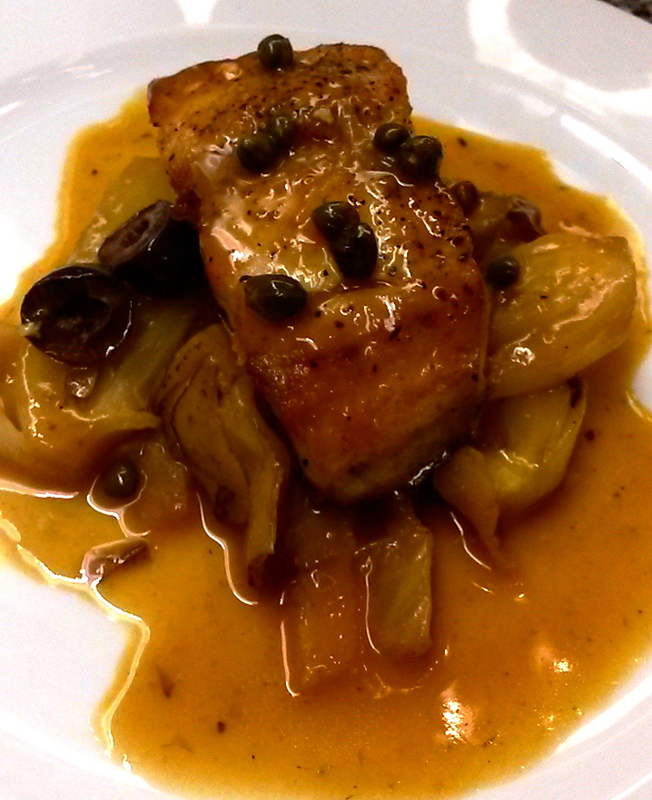 on a bed of braised fennel and artichokes in an olive and caper sauce. My fish was fantastic, tender and flaky like fish should be. The fennel and the artichokes that came with under the fish almost stole the show however, their long-cooked melt-in-your-mouth texture marrying harmoniously with the intensely savory olive-caper sauce. In case it wasn’t clear, I really liked this dish. Another shade of red came with this course, this time a Sauvignon with “aromas of cherries, blueberries, blackberries, and rhubarb”. Don’t tell my dad about the rhubarb though, he hates the stuff. I must admit, I was hoping for a different color wine so that the collection of glasses building up in front of my plate would be more rainbow-esque. I think I was supposed to finish the wine for each course so the glass could be taken away, but I didn’t want to overdo it so they just accumulated. Finally, the dessert! 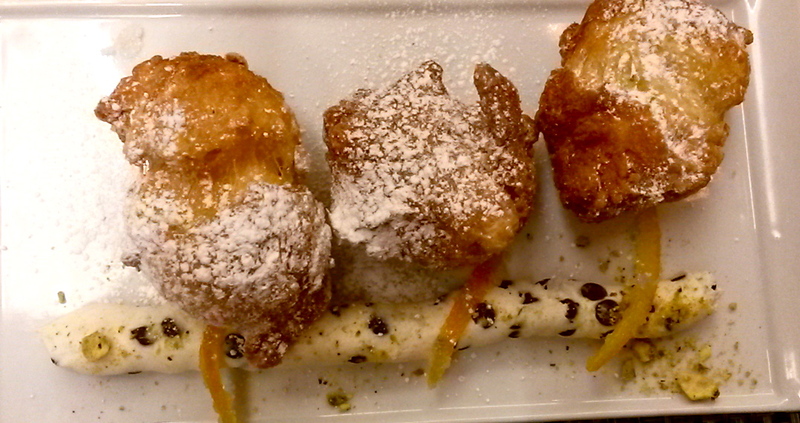 It was sfinci, which are fried dough balls with a ricotta filling that is similar to what goes inside a cannolo. These were deconstructed, to the consternation of my mother, as the ricotta was artfully piped alongside the fritters instead of inside them. The ricotta filling was great, but the fritters could have been fresher. I understand it is probably really hard to simultaneously supply a a full restaurant with hot-from-the-fryer fritters, so I still applaud the dish. The wine that came with the dessert, a Zibibbo and Malvasia dessert wine, was my personal favorite and the only one that I actually finished. That is due almost entirely to the fact that it was sweet and I like sweet things. My dad liked it so much he almost bought a bottle, so if you don’t trust my tongue you can take his word for it. 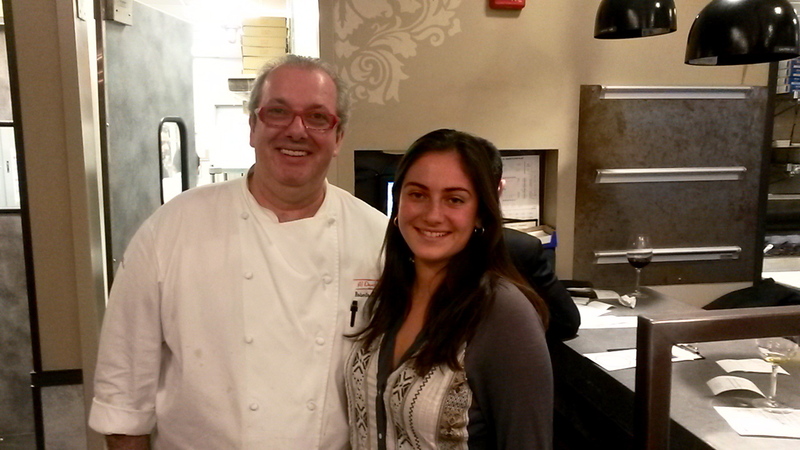 I also got a photo with the chef himself! So next time you’re in DC, you should check this place out for some quality Italian food.